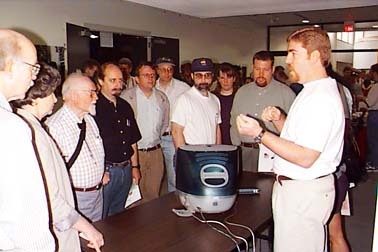 Washington Apple Pi helped open the Apple User Group Road Tour on May 23, 1998. A huge crowd showed up to hear about the latest PowerBook G3s, the future of Mac OS and Rhapsody, and the still-semi-mythical iMac. Apple did justice to the event, with a prototype iMac, two production PowerBook G3 machines, and the exquisite Apple flat-panel display monitor, formally known as the Apple Studio Display. Just getting into the auditorium was difficult; Mike Shebanek (on the right in white T-shirt, below) a product manager on the iMac team, talked about the forthcoming iMac in the lobby before his presentation on stage. Note the open panel for cables on the side (not back) of the iMac.